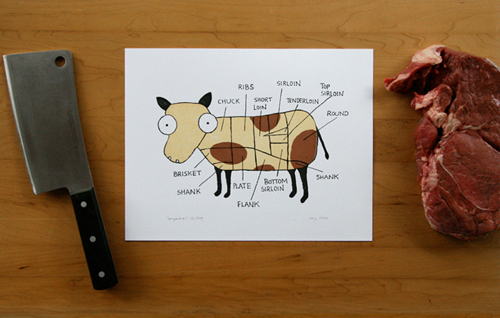 The first time I saw this Cow Parts print, I knew I wanted to learn a bit more about the artist. Turns out it's a collaboration between Julia and Collin Farill from Red Bird Ink in Atlanta and their friend, Lucy Laliberte. Lucy is responsible for the original drawing and then the Farill's created a letterpress image for the print. The final result would work perfectly in any meat lover's kitchen. What fun is cow parts without pig parts? Julia, Collin and Lucy collaborated again for this charming pig print. At Red Bird Ink, Julia and her husband Collin design and produce pretty coasters, prints and stationery. As Julia states on her site, "Our perspective is what makes us special. We see familiar things in unexpected ways." Pictured above, the Maidenhair Fern and the Fiddlehead Fern coasters. These numbered coasters are especially fun. Julia shares, "I was thrilled to get my hands on this set of antique wood type." These work great for numbered tables at a wedding or for any lover of design or old type. Inspired by hand knit sweaters and scarves are the Cable Knit coasters, which are particularly lovely. I'm a fan of all of Red Bird Ink's notecards- Love & Joy; Love You Mom; Eye Wear and Red Camillias. Julia concludes, "We are driven to design by our limitless interest in the world around us. Our mission is to inspire others to feel the same curiosity and delight that we do."